We are pleased to announce the third International Summer School of Crystallography at the Center for Free-Electron Laser Science at DESY, Hamburg (D). Prof. Carmelo Giacovazzo will lecture on the basics of crystallography, covering mathematical understanding of crystallographic point and space groups, diffraction experiments, structure factor calculations, systematic absences, determination of space groups and many additional topics. Dr. Thomas Schneider will cover the background of phasing algorithms for structure determination of biomolecules. Participants will also learn modern applications and instrumentation of protein crystallography experiments at advanced light sources, such as 3rd generation synchrotron and XFELs. 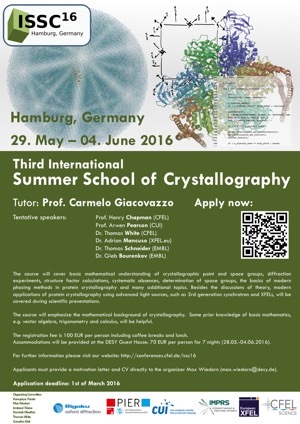 The summer school program is geared for PhD students working in the field of crystallography, but exceptions for motivated PostDocs and MSc students can be made. The course will mostly cover mathematical background of crystallography, hence we are looking for students, having a (bio)physics background. This will NOT be a workshop covering protein crystallographic programs but rather will be theory oriented. 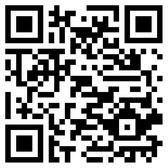 Besides the lessons there will be guided tours of PETRAIII/European XFEL, a BBQ and a harbor boat trip scheduled. Accepted applicants will be asked to pay a registration fee of approx. 100 EUR (includes coffee breaks). In addition, participants will have to pay for their own travel expenses, accommodation will cost 70 EUR at the DESY Guest House (rest will be covered by the school budget). Applications are closed and the acceptance letters have been sent out. Places and accommodation are limited to 30 students in total. Applicants must provide a motivation letter and a CV directly to the organizer Max Wiedorn. Please view the program section to learn more about required preparation and schedule. If you have any additional questions please contact the organizers. We look forward to welcoming you in Hamburg!